I’ve always been a bit obsessed with American History, even as a child. My ideal vacation was a trip to Gettysburg instead of a theme park, even at the age of 9. I also grew up with a family who loved to thrift and go “antiquing.” I still love seeing my Uncle’s antique war memorabilia collection or the vintage goodies my sister finds at her job at an antique store. Family heirlooms are definitely the most special antiques of all. Not only do they combine years of history and age with sentimental family memories, sometimes, every once in a while, they can also be incredible historical artifacts. My husband Joseph is basically a descendant of early American “royalty.” He is a descendant of some very notable names that made history throughout the Colonial and Civil War eras. Since he is also an incredibly talented furniture maker, it was only fitting that he got to take on a very special task over Labor Day weekend. One of Joseph’s famous ancestors is a Founding Father, Thomas Nelson Jr. He was one of the first Governors of Virginia, as well as a member of the House of Burgesses, and a signer of the Declaration of Independence. Being from Yorktown, VA, his estate was taken over by Cornwallis to be his headquarters during the infamous Battle of Yorktown. Being an ardent patriot, supposedly Nelson offered money to Continental soldiers to destroy his home during the battle. So why the history lesson? And where do family heirlooms fit into this? Well, Thomas Nelson Jr.’s incredible four-poster mahogany bed has survived and stayed in Joseph’s family for generations. Made using traditional woodworking methods that Joseph and I still use in all of our designs today, the bed is a magnificent piece of craftsmanship that has been loved and cared for over the ages by the family. At the request of the family member who now cares for it, Joseph had the honor to take the bed apart and examine it while renovations were being made to the room it is now kept in. 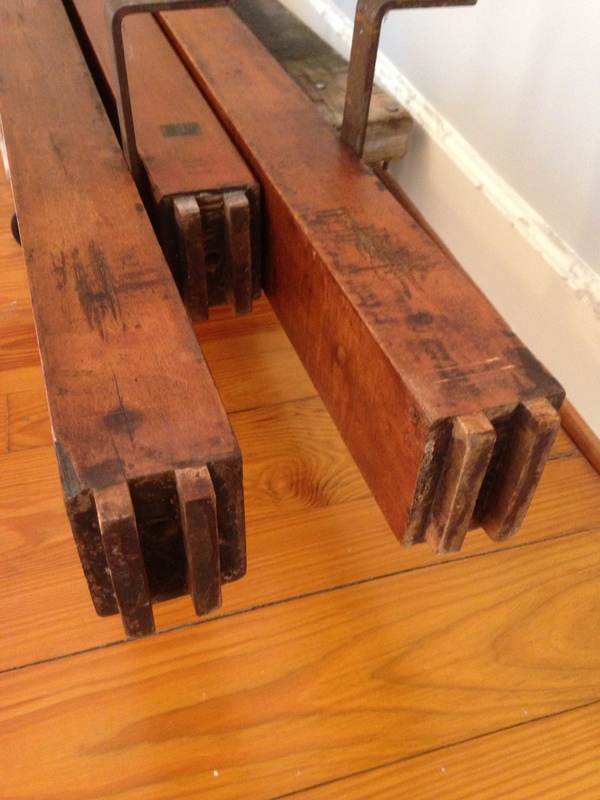 The rails are connected using double mortise and tenon joints. Double Tenons on the ends of the rails. Double Mortise on the posts. 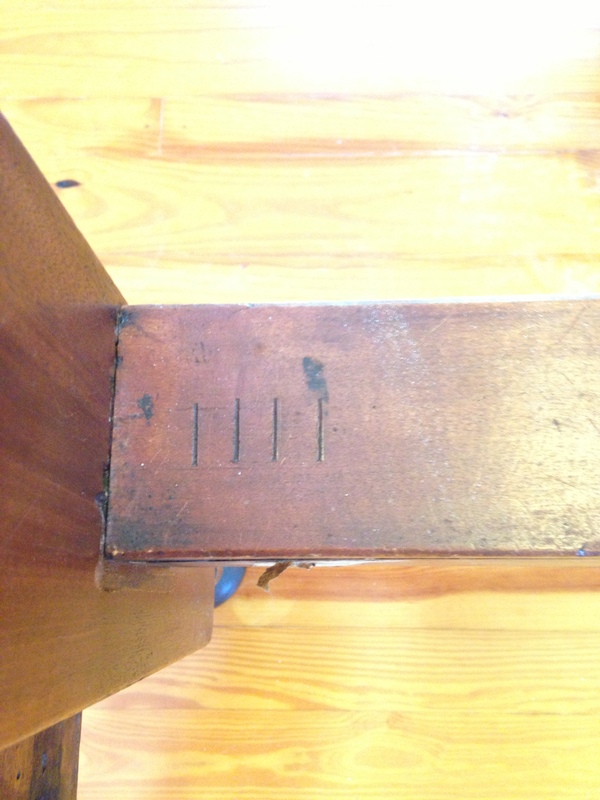 The original maker’s mark of “4” to identify matching posts and rails to help in putting the bed back together when taken apart. The bolts that are used to hold the rails to the posts are original, save for the head of one that was welded onto the original after it was broken. 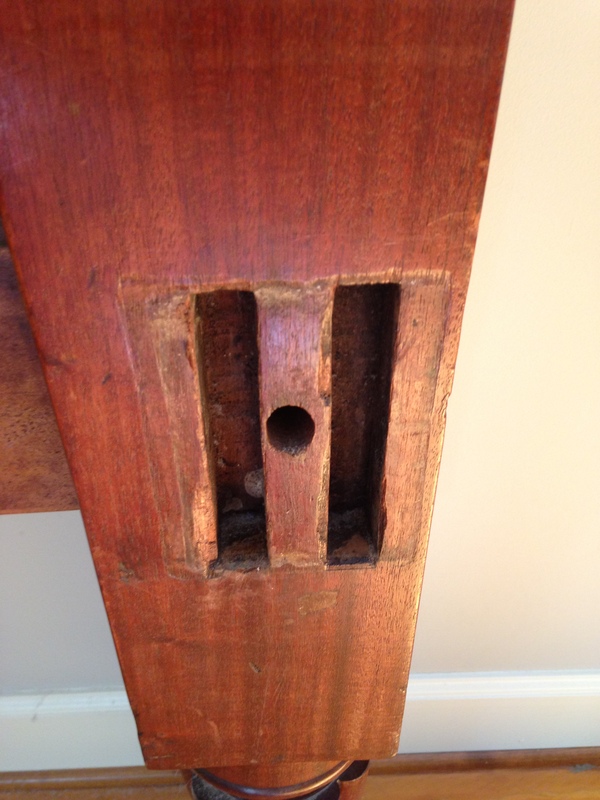 The iron mattress hangers and fasteners are all original. 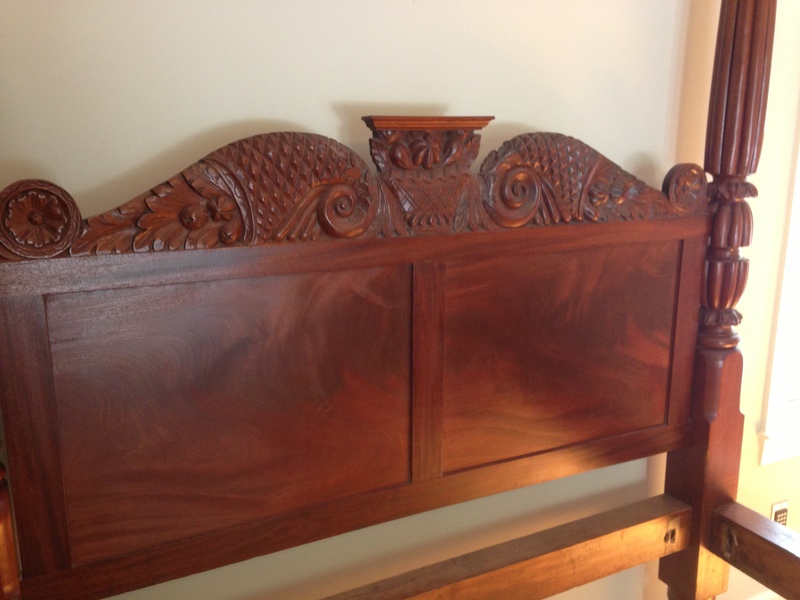 The visible part of the bed has been refinished, the back of the headboard is black with age and expired varnish. 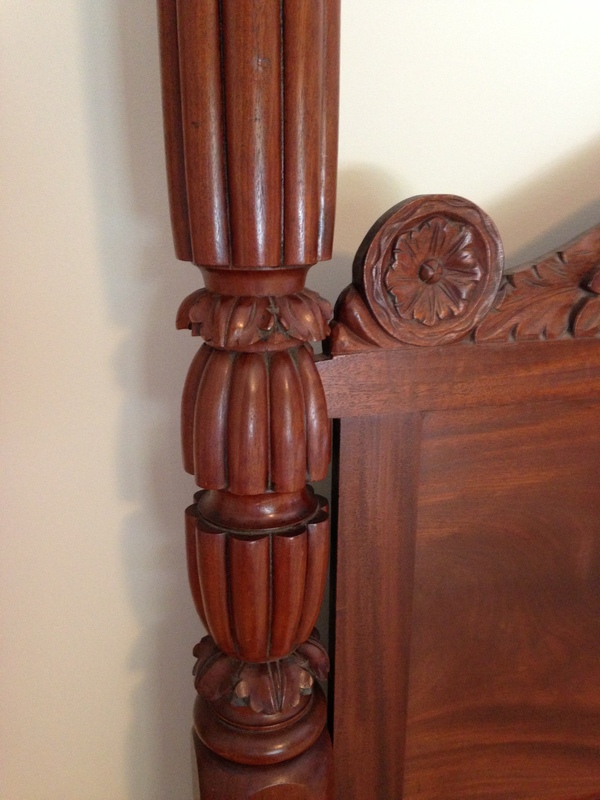 The carving on the bed’s posts and headboard are absolutely magnificent. The wood is undoubtedly virgin growth mahogany which is pretty much obsolete these days. The bed is now used as a four-poster style bed, however it is originally a teester-style bed, the brass adornments are kept in storage however the original fabric is long gone, lost to the ages. Another notable characteristic about the bed is it’s size. Although it is a queen sized bed, it is much smaller than today’s queen beds, as people were much smaller in stature 250 years ago. 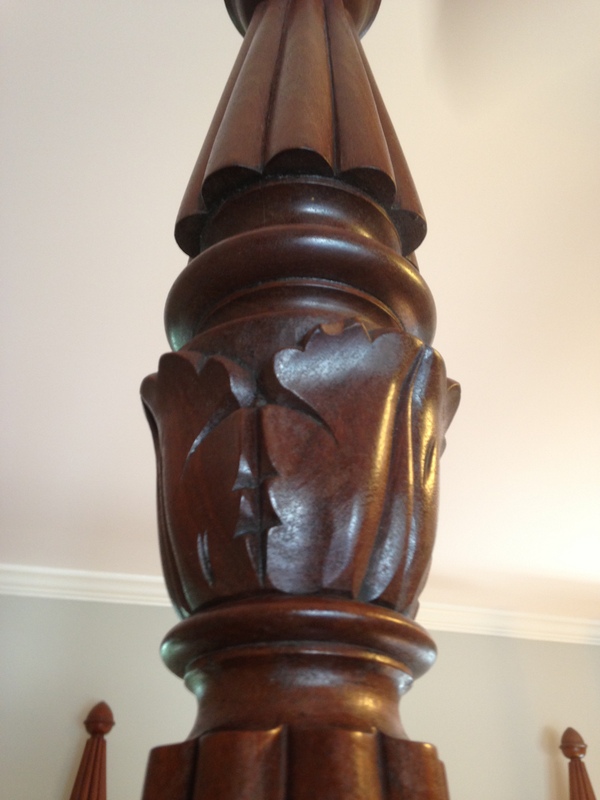 Another testament to traditional woodworking techniques is that despite it’s age and several moves across the country to different family members over the years, it is in excellent condition with no structural damage. Beds made even 50 years ago with modern joinery and fasteners may fall apart before this bed will. It is also unknown whether or not this bed was brought over from England or made in the states. 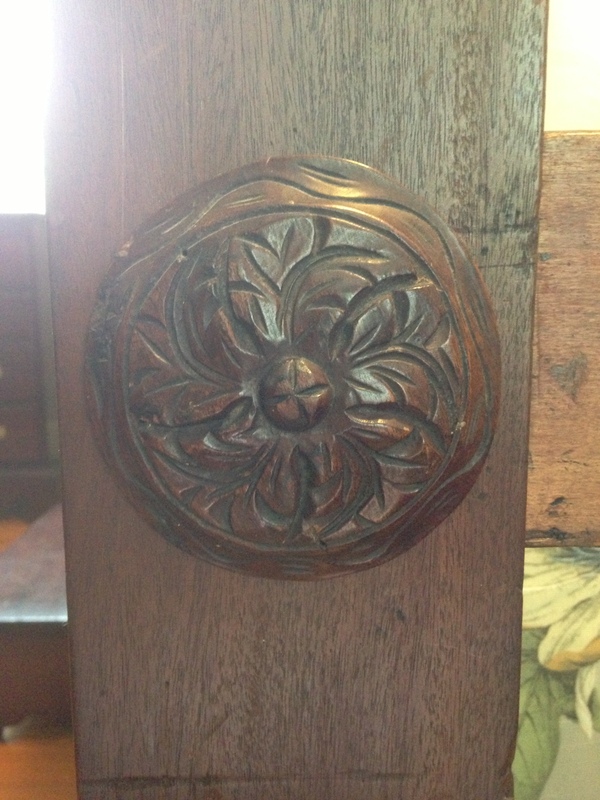 Perhaps my favorite part of the bed, and a testament to the original maker’s eye for detail are these wonderful carved rosettes that cover the bolts on the posts. While I was sad to not have been there personally for the deconstruction, I hope to be there when Joseph returns to put it the bed back together. I know it was a very special moment for him to examine such an important piece of American history, his family’s history, and also an incredible source of inspiration for our own furniture work today. All photos provided by Joseph Thompson. Side note: I posted a photo of the bed over the weekend to my Instagram page, and low and behold one of my followers and Charleston neighbors is also a descendant of Nelson. It’s a small world after all, folks! Wow. That is truly incredible! I love history, as well, especially in clothing and decor. The carvings on that bed are stunning! Great post! The carvings are simply amazing. Better than what any machine could do today, in my opinion. It has been a while since your post, but I’ve been in search for history on my antique bed with a canopy. It is very much like your bed in size and construction, except it is raised from floor, my grandchildren play under it. My husband bought the bed 17 years ago in a antique shop in Montgomery, Al. The only thing that I know is that it was pictured in a Magazine (antique), but he didn’t get the details in writing and the shop is gone. 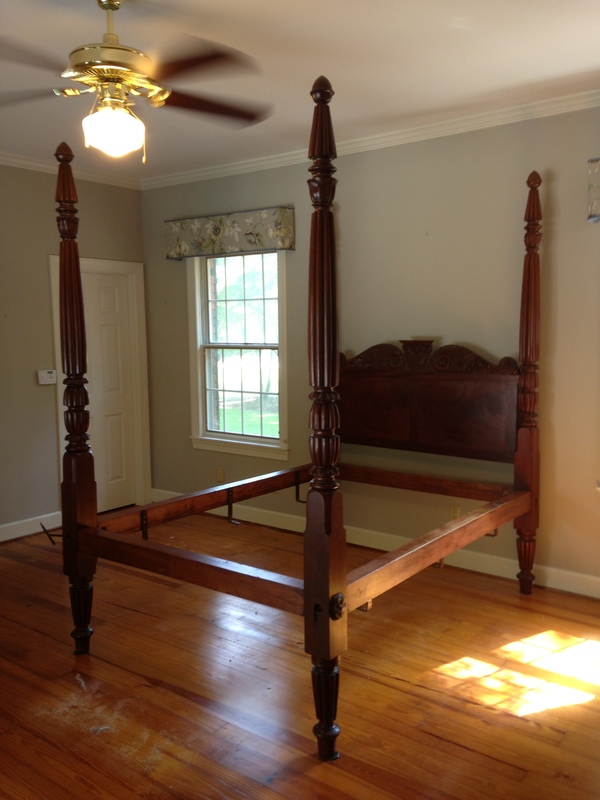 Other than getting it appraised which is expense, how can I find out about this bed.Any ideas?